Amber Rudd, newly appointed UK climate secretary - a closer look into her views on climate change. After spending almost a year as a climate change minister, we look into her previous voting history to see where she stands on the policies surrounding her new role. On 14 Sep 2011: Amber Rudd voted against requiring landlords of private rented homes to make their properties meet regulations on energy efficiency by January 2016 rather than April 2018 as initially proposed. On 11 Jun 2012: Amber Rudd voted in favour of establishing a Green Investment Bank, strengthening copyright law relating to commercialised works, encouraging employment disputes to be settled outside of tribunals, and other business related reforms. On 17 Oct 2012: Amber Rudd voted against requiring the UK Green Investment Bank to explicitly act in support of the target of reducing UK carbon emissions to 20% of 1990 levels by 2050. On 17 Oct 2012: Amber Rudd voted in favour of establishing a Green Investment Bank, strengthening copyright law relating to commercialised works, encouraging employment disputes to be settled outside of tribunals and other business related reforms. On 19 Dec 2012: Amber Rudd voted to reform the energy market with regard to reducing carbon dioxide emissions, securing supply, affordability for consumers and increasing generation from renewable sources. 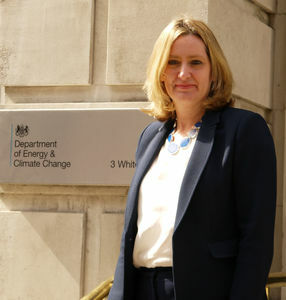 On 3 Jun 2013: Amber Rudd voted not to exempt electricity generation plants using carbon capture and storage technology from annual carbon dioxide emissions limits during a commissioning and proving a period of up to three years. On 4 Jun 2013: Amber Rudd voted against requiring the setting of a target range for the amount of carbon dioxide (or other greenhouse gases) produced per unit of electricity generated. On 4 Jun 2013: Amber Rudd voted against allowing financial incentives for small-scale low-carbon generation of electricity to be paid to plants which were previously too big to be eligible. On 4 Dec 2013: Amber Rudd voted against allowing carbon dioxide emissions limits to be set in respect of existing stations which fit pollution abatement equipment. http://amberrudd.co.uk/ On Rudd’s site you can see her six-point vision for her constituency including; improves transport links, raising educational standards and protecting creativity and tourism.